After a few weeks off, it seemed that Once Upon A Time had finally found its footing in this rocky seventh season. Unfortunately, the show has reverted back to its confusing roots that are plaguing the season. Seemingly out of nowhere, this episode makes little sense, has minimal explanation, and goes on a totally different path that the last episode didn’t begin. I don’t particularly like that this season is so jumpy and can’t commit to a continuous storyline. Yes, the scenes that take place in Seattle typically continue the same story, but they are all over the place and accompanied by scenes from the past that make little to no sense. This is going to be a pretty short analysis because I couldn’t figure out what was happening in this episode. The story in Seattle continued from where it left off, but it felt like it was something totally different. There are three things worth mentioning from this part of the story, since most of it focuses on Lucy being in a coma. First, Anastasia has a lot of raw power and is the only person in town with magic. It doesn’t make sense that she can use her powers in Seattle when none of the other characters with magic can, and of course, no one even tries to give an explanation. 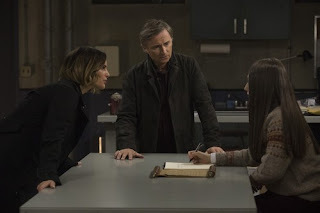 Gothel, Drizella, and Rumple have their own plans for the newly resurrected teen, but Gothel wins this round. She steals Drizella’s magic and gives it to Anastasia, but her plan isn’t clear. The second plot point worth mentioning is the return of Zelena. The purpose of Regina and Henry’s trip to California was to find the missing witch. Regina wakes her sister up and drags her back to Seattle to try and help Lucy and maybe defeat Gothel. I really don’t know what Regina thinks they can do without magic, but it was nice to see a familiar face. It was also good to see that Zelena is still a good person like the last time we saw her. It does appear that Zelena may stick around for a few episodes as well. Lastly, Henry tries to believe Lucy’s stories about how they are all fairy tale characters in order to wake her up with true love’s kiss. When reading about how Emma woke him up from a similar coma, Henry thinks it could work for Lucy. However, there are two major problems here: Henry doesn’t fully believe that the stories are real, and Lucy gave up her belief. It wasn’t very surprising that Henry’s kiss didn’t work. Things in the fairy tale land were awfully confusing this time around. For starters, a major time jump shows Lucy as a baby, and then on her eighth birthday. I could be wrong, but I don’t know if Henry and Cinderella had even kissed in prior episodes. If they did, it was only once, which makes this time jump even worse. We all know they wind up together, but to jump eight years when they were in the middle of a story was a bad decision. To make matters worse, Lucy is the only character that has aged. Regina and Zelena make a joke about time-lines, but it wasn’t that funny because they really do need to explain everything. The jumpy time-lines lead us to the eventual casting of the curse that brought all of the characters to Seattle, which was confusing and lame at the same time. Drizella created the curse, but needed Regina to cast it since the final ingredient was the blood of someone who had crushed the heart of the thing they loved most. To get Regina to comply, Drizella teams up with Gothel and a coven of unknown witches to poison Henry. The only way Henry survives is if Regina casts the curse. Things go south quick because the better choice here was to simply let Henry die and for all the characters to kill the witches and end their misery. Since that didn’t happen, everyone is upset that Regina casts the curse. The funny part is that if the curse is broken in Seattle, then Henry will die. At this rate, when the curse does get broken, I’m sure they will find a way to save Henry because it is too late to kill him. The mystery witches have no role, yet are made to seem extremely important. They have also made the trip to Seattle, which appears to be the next storyline when the show returns in 2018. The entire episode jumped from past to present too quickly to really give the audience a good grasp on what is happening, what the purpose is, and what direction the show is heading in. It really is a shame that the second to last episode of the year put the show back on track and then this episode destroys all the progress. Without some more detail and explanation of what is happening in each episode, Once Upon A Time is going to be unwatchable.